The strong satisfaction scores suggest GM's service departments can effectively engage consumers during the recall crisis, a J.D. Power executive said. 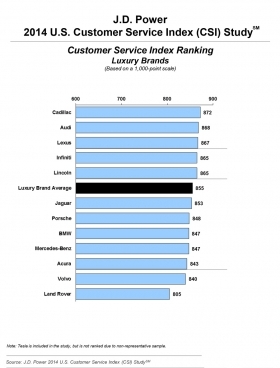 Cadillac overtook Lexus to top a survey of customer satisfaction with dealership service departments, giving General Motors twin victories in a benchmark study released today by J.D. Power and Associates. Cadillac’s first win in the luxury category ended a five-year reign for Toyota’s luxury arm in Power’s U.S. Customer Service Index Study. 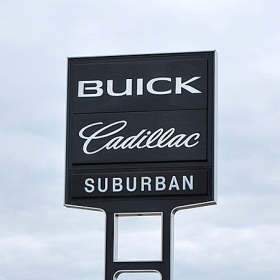 Buick ranked as the top mainstream brand for the first time, joining GM’s Chevrolet and GMC among the top five in that category for a fourth straight year. GM’s ability to satisfy service customers will be tested this month as dealerships begin repairing cars following the February recall of 2.2 million U.S. vehicles for defective ignition switches. They are part of a global recall of 7 million cars in the first quarter of the year -- equal to the automaker’s total in the last four years combined. The strong satisfaction scores suggest GM’s service departments can effectively engage consumers during the recall crisis, said Chris Sutton, senior director of the U.S. automotive retail practice at J.D. Power. 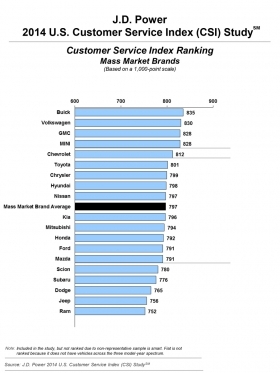 The 2014 Customer Service Index measures how satisfied owners and lessees of 1- to 5-year-old vehicles are with their service at franchised dealer facilities for maintenance and repair work. Scores are based on a 1,000-point scale. The industry’s average on the mainstream side rose eight points from a year earlier to 797, while the luxury average improved nine points to 855. Buick’s score of 835 bested No. 2 Volkswagen by five points. GMC fell to third from first a year earlier, even though its score rose 9 points. Mini and Chevrolet rounded out the top five. Chrysler’s Dodge, Jeep and Ram finished at the bottom of the survey at 17, 18 and 19, respectively, echoing their 2013 places. On the luxury side, Cadillac’s 872 exceeded No. 2 Audi’s 868. Lexus, Infiniti and Lincoln were also in the top five. Acura dropped out of top five in 2013 to rank third from bottom, followed by Volvo and Land Rover. Beginning with the 2010 results, the survey was split into mainstream and luxury categories. Lexus overtook Jaguar to top the entire industry in the consolidated 2009 survey. Buick and Audi had 26-point improvements in the 2014 study. Kia, with a score of 796, had a 22-point boost to finish just point below the mass-market average. And Toyota (801) ascended to sixth place among volume brands after a 21-point gain. In 2013, Toyota was in 12th place and nine points below the industry average. Sutton said it’s an encouraging sign for the industry when there are several 20-point increases in concert with only a few brands seeing minor declines. Editor's note: GMC's score rose 9 points this year vs. last year. A previous version of this story misstated the number of points.